I first reviewed Massimo Dutti’s Personal Tailoring product three years ago. The made-to-measure ‘tailoring’ concept was a straightforward adjustment of a Massimo Dutti suit block. Once the jacket size with the best fitting shoulders had been selected, the tailors set to work with their pins pulling in the waist, removing excess fabric on the arms and correcting the height of the trousers. Styling options were limited. The only choice was a single-breasted suit with standard width notch lapels; a classic no doubt, but very basic. There were different swatch books representing different price points, using fabrics from the likes of Cerruti and Loro Piana, mostly in greys and blues – very sober, very sensible. There were some great touches; horn buttons for braces, fine finishing and raised stitching on buttonholes. However, there were also some frustrating limitations. Only one pleat was possible, not two, and the standard trousers came with belt loops but were not available with side adjusters. Waistcoats were possible, but only in a single breasted design. It was good. It just wasn’t great. By comparison with the possibilities for personalization with bespoke tailoring, it was a creative straitjacket. It’s fair to say now that Massimo Dutti’s improved Personal Tailoring service is a little better. Firstly, the ‘double’ options have opened up. Double-breasted suits, and double-breasted waistcoats, are both available. And double pleats on the trousers? Absolutely. Secondly, the fabric selection has been ramped up. There are now three distinct suppliers of fabric, forming three price levels for the service. The first level is Vitale Barberis Canonico; the second level is Loro Piana and the top level is Scabal – a nod to Massimo Dutti’s determination to bring a little Savile Row to their very Italian stable. Given Massimo Dutti’s high street status, there will likely be a few raised eyebrows that they are using fabrics from such esteemed mills. After all, these names are normally associated with the grand tailors from Savile Row, Paris and Milan. Personal Tailoring now has three distinct collections: Extreme Lux, Business Lux and Country Lux. Massimo Dutti explains “…each collection has a limited edition range of fabrics and colours.” In other words, each collection ‘design’ has a limited run and is then refreshed with different fabrics – an approach that is very familiar to holding company Inditex, owners of fast-fashion masters, Zara. At the heart of these changes to Personal Tailoring is a man who holds the title of Duke of Feria. He is the head of an ancient aristocratic family that traces its roots back to the royal family of Aragon. His name, Rafael de Medina, might not be familiar to readers, but he is one of the most celebrated members of the Spanish nobility; a tall, striking man with the looks of a Ralph Lauren male model who once ranked on Vanity Fair’s International Best Dressed List. Appointed as Director of the Personal Tailoring offering at Massimo Dutti, after setting up his own clothing venture Scalpers (think of a Spanish J.Crew) Rafael de Medina oversaw some vital changes to the limited and, arguably, half-hearted Personal Tailoring set-up. In addition to the introduction of the three collections, there is a Personal Tailoring ‘Paper’ (currently in Spanish only), an upcoming Premium Area where customers can access their account, view their orders and even place more orders – much like an online-only tailor – and accompanying shirting and accessories which match the look of each collection. As before, you make an appointment with the Personal Tailoring tailors and they hand you a jacket in your rough size (36” for me) to try on. In this case, they had a 34” that fit better in the shoulders. Then, you repeat the process for the waistcoat and trousers. They pin all over the jacket, waistcoat and trousers to learn how much each item needs to be adjusted from the block when it is made by the company’s tailors in Portugal. The whole process takes about 45 minutes. Then, the order is placed once you select your fabric and details. I chose a subtle charcoal Prince of Wales check from the Vitale Barberis range. The stylistic choice was the Extreme Lux collection: wide peak lapels, a double breasted waistcoat and double pleated trousers with turn ups and side adjusters. I selected dark horn buttons and a Burgundy lining to finish it. After the soberness of the previous fabric collections, sensible cloths still prevail but there are now some exciting patterns (thick chalkstripes, Prince of Wales checks) to complement the plain blues and greys. 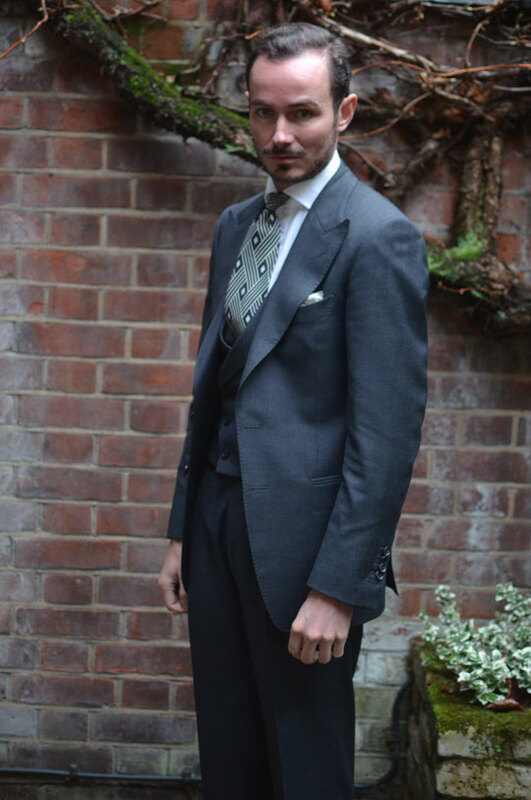 The price for this was £390 for two-piece suit, and an extra £90 for the waistcoat, making a total of £480. This is the entry level price, so is significantly more than the £380 being charged in 2013. Waiting time for the suit was a little over a month, which is the standard for Massimo Dutti, however, the trousers that came back were wrong. It turned out the high waisted trousers I had selected were only available flat-fronted. So, the first pair of trousers did not have the requested pleats. It was slightly shocking that the makers in Portugal did not contact the store and tell them this, particularly as I was told I’d have to wait another two weeks. It was a little over three weeks when I called up to find out that the new trousers were ready, so in total it took nearly two months. Remembering how I had been impressed with the quality of two previous suits from Massimo Dutti Personal Tailoring, both in fit and finish, I was a little hesitant to get my hopes up that this could be any better. However, I needn’t have worried. The finish was every bit as good and the fit is arguably better. The standard construction of Personal Tailoring suits is half-canvas; you pay extra for full-canvas construction. Nevertheless, the body of the jacket drapes beautifully. Admittedly, there is very little sculpting on the waist characteristic of fine bespoke, but then this is made-to-measure and it’s hardly a blocky shape. Again, Massimo Dutti triumphs on the excellence of the finish. Buttonholes are carefully stitched, buttons are high quality. 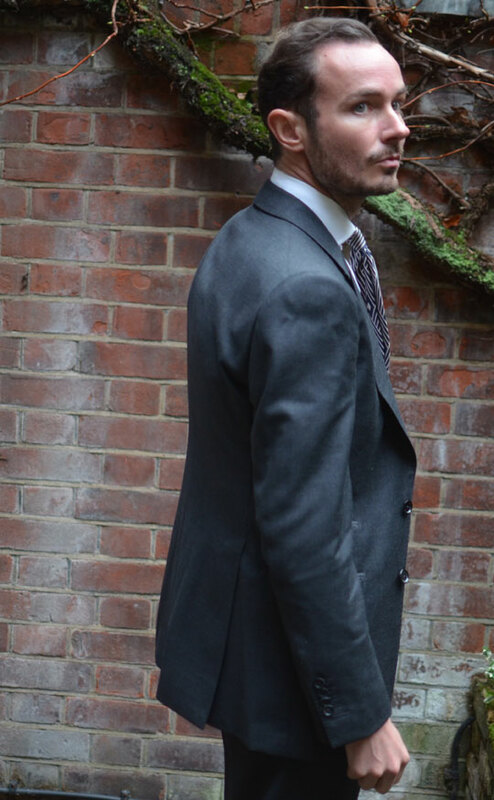 The use of a good fabric definitely improves the overall suit, and like a ‘bricks and mortar’ tailor, it definitely helps being able to choose the fabric in person. Fit: 8 out of 10 – A very good fit, given that this is made-to-measure adjustment of an existing block. It’s not perfect, and so anything higher than 8 out of 10 feels a little punchy; armholes not as high as they could be, waist could be more suppressed. However, it’s way better than off the rack suits from high-end retailers that cost 2-3 times more. Would be keen to try the double-breasted suit to see how it compares. Fabric: 9 out of 10 – Definitely one of the main reasons to go for Massimo Dutti over similarly priced internet tailors is not only the process of choosing the fabrics (in-store, touching and comparing) but the quality and range too. The fact that they now have collections from three very highly esteemed mills including Scabal and Vitale Barberis is a major selling point. Quality of finish: 9 out of 10 – Outstanding for this price point. It feels more like a garment from a tailoring house than a mid-market high-street store. It’s not exquisite – no showstoppers like Milanese buttonholes – but it’s very, very competent. Service: 5 out of 10 – Where Massimo Dutti falls down is service. It’s a shame to say it, but service quality on this outing was poor. It had been excellent on the two previous occasions, so perhaps this was a one-off, but there were a number of issues. The first issue was the lack of communication between the suit makers in Portugal and Massimo Dutti tailors in London on the trouser issue. Massimo Dutti did apologise for this, but no other dispensation was offered. Given this resulted in a heavy delay, this is disappointing. I had to chase the tailors for updates and my calls were rarely returned. When I paid for the suit, I was initially charged more than I should have been, and had to indicate this to the sales staff. A lot of this is down the fact that Massimo Dutti is a high-street shop – not a tailor – and their staff are busy with other things. Their level of service training is therefore bound to be somewhat lower and less experienced. It could be that staff are overworked in store; rushing back and forth from stock rooms, dealing with tills, customer enquiries etc. If so, some system needs to be implemented to help them. These aren’t ‘budget’ MTM suits, and Massimo Dutti’s positioning in the mid-market of menswear needs to accord with a slightly higher service level than the mass-market. Overall satisfaction: 8 out of 10 – This feels harsh, as I am very happy with the suit. However, I’m not rushing back there just yet. Good things come to those who wait, and I have no problem with the time it took to receive the suit. However, this did not fill me with confidence on the service front. This needs some serious work if Massimo Dutti is going to differentiate itself from ‘other high street’ brands that it considers itself superior to. The product is stronger on this occasion; as it should be for a 25% markup in just 3 years. The service needs a bit of work, and hopefully the introduction of the Premium Area (through the website and app) where “you’ll be able to see all your orders, place new ones, manage your appointments…” will add some degree of access and reassurance that is currently not possible through the existing medium of individual contact with the tailors. At one point, you said your comment seemed harsh. I’m afraid I would have been far harsher. You are right that “for the price” this looks pretty good and for many this gives an affordable way to achieve a higher style. But for me, I think the result is wasted money. 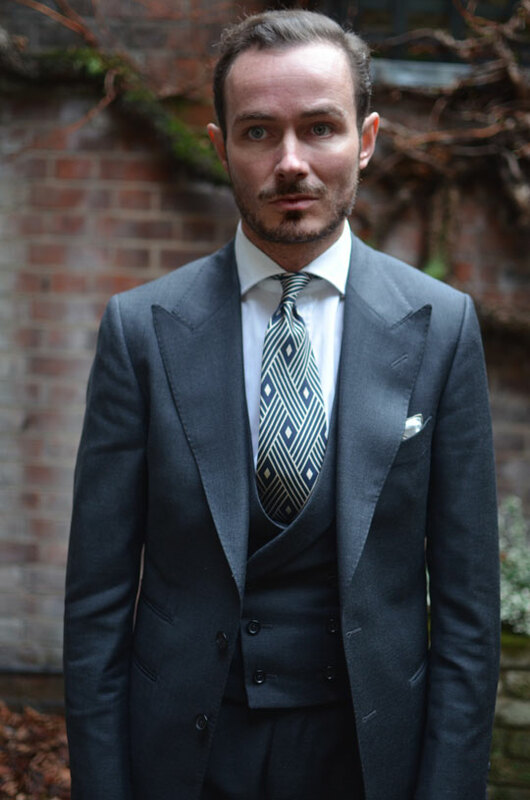 The wide lapels are a great option which I like but they are not exactly proportionate with your torso width. I’m guessing the width is fixed regardless of chest size here. The real problem is the fit across the back. The humps and rolls under the arms would have me returning that jacket. Overall it’s a good choice of color and style on your part and it’s clearly nice fabric. 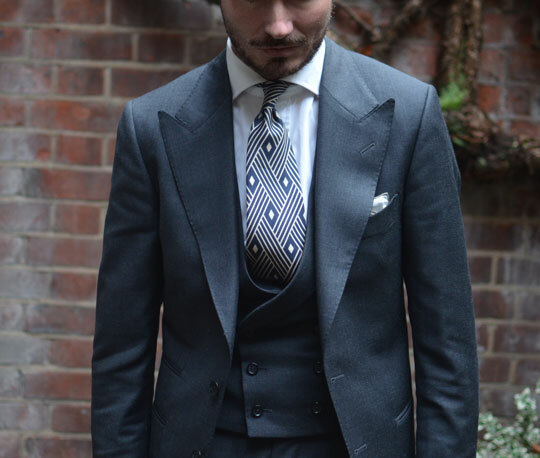 Just unacceptable fit in the jacket and the many small details that you would not have to deal with in bespoke. Yes, bespoke is a lot more expensive and maybe it’s not an option. But for me, I tried these options and can’t live with the result. I look at it this way; you are already paying a lot and going though a long process. You are hopefully going to be able to wear these clothes for many years so they are investment pieces. Another point is the distracted customer service. I need a much better level of service from an outfit like this. I’m afraid that I agree with the previous comment – the marks awarded for fit seem extraordinarily generous. 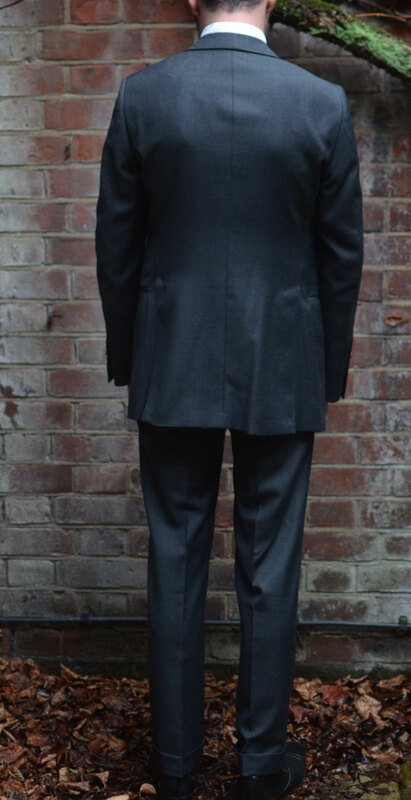 The back of the jacket is covered in lumps and bumps, while the waistcoat looks tight across the stomach and stands away from the chest. I would suggest that those looking for affordable M2M would better served by buying off the rack and budgeting for alterations. Thanks both for your comments. I would agree with you both that it isn’t perfect. I would not agree that it is covered in lumps and is a mess. I think this is exaggeration. I think it’s definitely something which could be corrected. I also think it’s worth noting that the lump over the centre seam could be removed by letting the centre seam out by 0.5 inch. I like my waistcoats tight so this is personal preference. In my view waistcoats should be tight and short. Not everyone agrees with this. I would agree that my torso isn’t the ideal size for the lapels. The lapel width is very much fixed. This is not made to measure to that degree. However, I got to try this on in the store (in this rough size) and liked the size of the lapels so, once again, it’s personal preference. The suit does not fit, especially in the back. Also it looks un-ironed. Secondly, you should get the services of a professional photographer. What does the silhouette of the jacket look like when buttoned (presumably it was unbuttoned when the pictures of the back were taken)? I’m also wondering if the Suitsupply style wide lapels work better when the jacket is buttoned? I’d be interested to know (roughly) the difference in cost between this and the blue Cad three piece with the DB waistcoat that’s been in your instagram feed recently, as that seems to be in a different league to the Inditex suit in terms of cut and fit. I appreciate that a UK Factory MTM like Carl Stuart might be a more appropriate point of comparison. Lapels and fit: I didn’t take any pictures of it fastened. I will in future but it will be on Instagram, not here. The difference in cost is significant. The bespoke Cad suit in that same fabric would cost £2000. Cad is probably the best value on Savile Row too. Others would charge c. £3000. I’m sorry I just can’t be as down on this suit as everyone else is. I was paid nothing by the brand to write this review and I paid full price for this suit, unlike many others who eulogise about other brands, some of which, I think, in no way justify their massive price. I am trying to help people who cannot shell out £2000+ on a suit because they have a house to save for, mortgages, children’s school fees. They just cannot justify the indulgence that all the Styleforum enthusiasts can. Many of these people I meet are trying to find good alternatives; where can they go that gives them a reliable option, a decent suit that doesn’t cost more than half their monthly salary. These people tend to be forgotten by the groups online who just say bespoke is the answer to everything; it is when you care more about clothes than anything else but it isn’t when you don’t. I’m afraid these people don’t seem to be reading much anymore, and I don’t blame them. No disrespect to all who have commented on here, except maybe MH. Opinions are always valued but I draw the line at obvious trolling about suits needing ironing and needing a professional photographer. Based on the commentary, my suit reviews seem to have become irrelevant and I have apparently become, or have always been, blind to the ‘serious’ faults in these products. However, the unachievable perfectionism and financial fantasy that dogs high end menswear forums is something I want nothing to do with. Enthusiasts have become way too blase about cost and I don’t identify with the cult. It’s too easy to forget that many people cannot even afford suits of this calibre. I believe that style is democratic and that whilst serious faults are to be corrected, men are so focused on the technical aspects of sartoria that it utterly bores me. I am therefore clearly not the right person to be reading for suit reviews, which I don’t think I’ll bother with from now on. Probably best to stick to blogs which are far more forensic in their critiques of £3000 suits. Winston – I appreciate your honesty and, to be fair, the fact that unlike others (Crompton, Bown etc) you do show more affordable clothes. I also respect the fact that unlike the others you usually buy your schmutter AND if you don’t you let us know that. I would miss your reviews but I can see that for a lot of people here it seems to be pearls before swine…. BTW – Loved the suit. I also like the fact that you review the more affordable end of the M2M market. I just happen to think that in this instance the suit does not appear to fit very well. And no, I’m not comparing it to a £3,000-plus Savile Row number but rather some of your earlier online purchases from the likes of Dragon Inside etc. I hope you will reconsider your decision to stop posting reviews. Just wanted to add that I hope you do indeed continue to review M2M suits. I’ve been reading your articles since I first became interested in menswear and I’m very much of the demographic that is interested in finding “better” clothes but cannot afford to just bespoke everything! I love styleforum but I do agree with your points on the group-think over there.Please keep doing what you’re doing. I’ll just add that I’m a journalist by trade and I’ve had my fair share of negative commentary in articles I’ve written, I might take some points on-board, but I’ll be damned if I’ll let anyone else influence what type of content I write. I would also agree that your suits from Dragon Inside and others seem better. I discovered Dragon Inside (now Oliver Wickes) through your review and I’ve since bought several jackets and suits from them and couldn’t be happier. Your review of Tailor4Less also encouraged me to take the plunge after being uncertain for several months and I was very happy with the overcoat and jacket I’ve had from them. If I hadn’t read your reviews I’d be none the wiser. So do please continue! The “style” is a mess — single breasted with peaked lapels, besom pockets, doubled breasted vest with peaked lapels?? Construction looks pretty shoddy — jacket back is a rumpled mess, sleeve heads are puckered, vest does not fit. Does not look like you got your money’s worth or it can be fixed. I disagree with the comments, the suits looks really good. The pocket square is a nice touch as well. Are not exactly proportionate with your torso width ? Many peoples love wide lapels (some of these are considered smart dressers or dandies,for exemple Lapo Elkan),so the widht of the lapels is matter of personal taste. Have some problems that can be correct by a good alteration tailor. More,the suit seems not well ironed. I not see particular problems. Maybe can be good iron out the garnment,specially the the lower edge in the point of last button. The suit have a good value for money. My suggestion is to try the next time with a double breasted (without waistcoat). Another wise advice could be to keep simple the style. 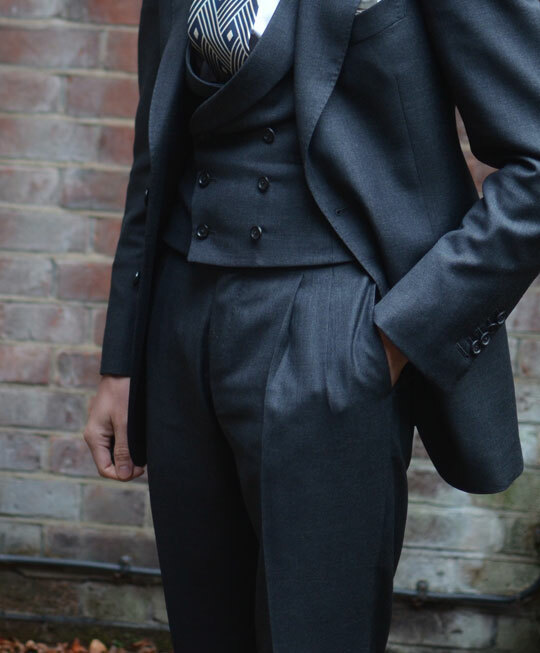 The model that you have select ( double breasted waistcoat,wide peak lapels) can be complicated to obtain from a MTM firm. Order notched lapels and single breasted waistcoat,or a three buttons without waistcoat,or at the most a double breasted. Keep it simple; is Massimo Dutti,not Chittleborough & Morgan. On the clothes forums have read many destructive reviews on very expensive bespoke suits cuts by famous British and Italians tailors. I think that if today the Duke of Windsor,Fred astaire and Gianni Agnelli showed their suits on forums and blogs would be covered by criticism and harsh comments. I think that your suit can be not perfect,but is good (specially for the price). Only,i back to recommend you to avoid on MTM suits dandystics touches as double breasted waistcoats,peak lapels on single breasteds. Clean and simple is the secret with MTM.